The first thing you need to do is create a group conversation to trigger the feature’s appearance. 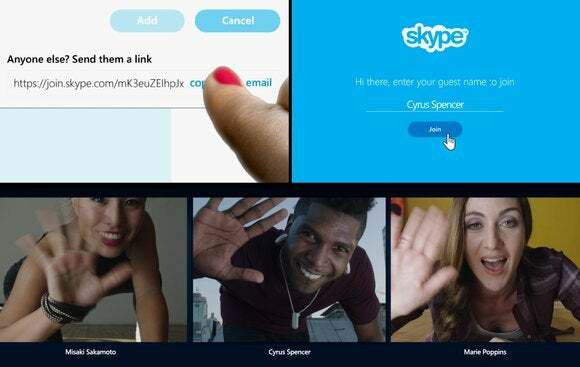 Add a second person to your group conversation to get your first Skype link. Select a contact from your list and double-click to open a chat window. Now, at the top right of the window, click the add contact button. Next, select a second contact and then click create group. 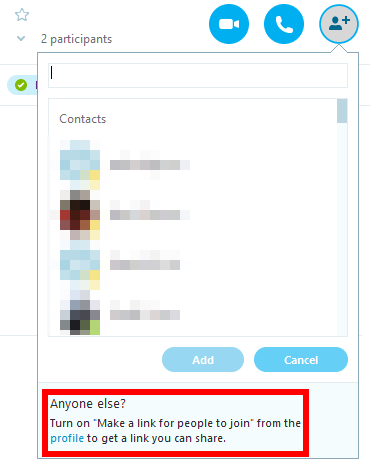 Click “profile” to enable Skype links. Once that’s done, click the add contact button again, you should see a message at the bottom of the add-contact drop down that says “Anyone else? Turn on ‘Make a link for people to join’ from the profile to get a link you can share.” Now click “profile,” which will open a new window. The link will then appear right below that. It will also appear whenever you click on the add contact button inside a group conversation. You only have to do this once and the feature will be available across all conversations. Let’s say you wanted to have a one-on-one conversation with someone who didn’t have a Skype account. Once you’ve activated Skype links, all you have to do is click “+ New” from the main screen and after a few seconds a share link will appear in the new conversation window. People on the receiving end will be able to log in to the conversation without an account, using Skype for Web on the PC. On mobile, however, they’ll need the Skype app and a Skype account.